First though, there has been a crime in the Den on a grand scale. The perpetrator is one "do I look like I care?" 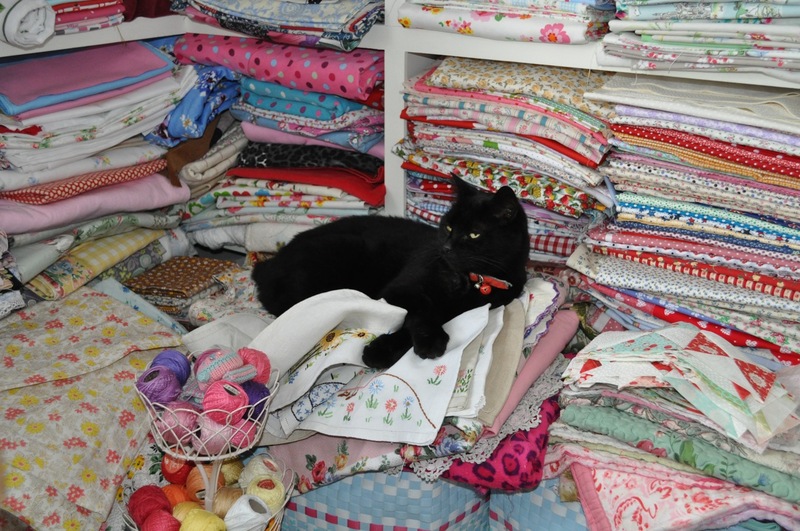 Mr Vorey-Puss who has found himself oh such a cosy bed in my freshly washed and ironed collection of vintage embroidered tea cosies. Aaarrgghh! Looks like Rabbity has found himself a bed, too. This is a little smaller than many of my quilts, more suited to a throw for a sofa or chair though it is big enough to top a single bed. I think it would look just the ticket on a plain sofa. You may have recognised if you are a bit of a fabric afficionado, that the fabrics I've used for the quilt top are by Tilda, the Norwegian company which produces books featuring very cute sewing projects and then has a line of sewing and crafting goodies to match. The top is pieced from 5" squares largely with an appley green and raspberry red colour scheme (bought for me by my sister, isn't she nice). The fabrics span several of their ranges including the most recent, featuring that fabby pink/green on white stylised flower print that looks a little like an Orla Kiely design. I added in some green and pink tiny polka dots and also some green and claret coloured batiks. It is one of those quilts which looks much better made-up than it did on the design board (what design board?) I am really pleased with it, probably because my favourite colour combo is pink and green. 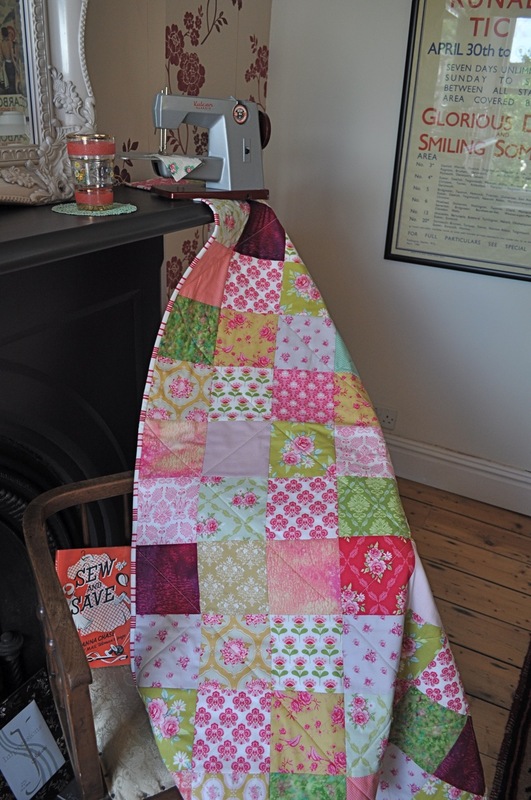 Most excitingly, because this quilt is 40" wide, I could splurge and use a gorgeous backing fabric which is indeed a delightful rosy design by Tanya Whelan I've long been cosseting in my stash. It really makes this quilt with its simply pieced top. I wish more designers would produce wider backing fabrics so that I could use this sort of fabric on the back of my quilts more often. 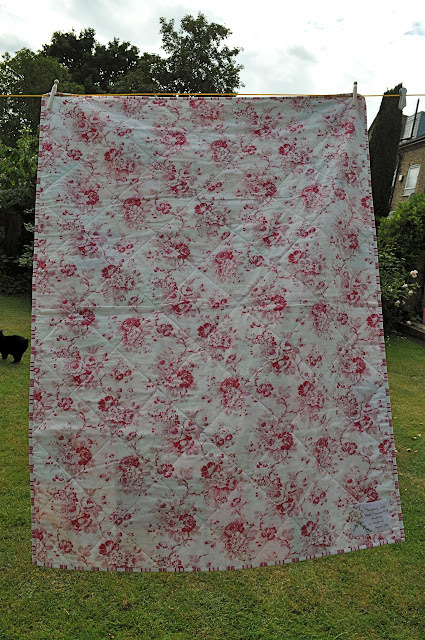 You see, to back a quilt of the larger size I usually make using these 44" wide designer fabrics, would take at least 3.5 metres of fabric, (needing two widths joined across the quilt), and now prices here in the UK are scaling £12 per metre, I find that hard to justify. I've used another Tanya Whelan fabric, this time white with classic red stripes, to provide a fetching binding. There is a little vintage embroidered name patch. 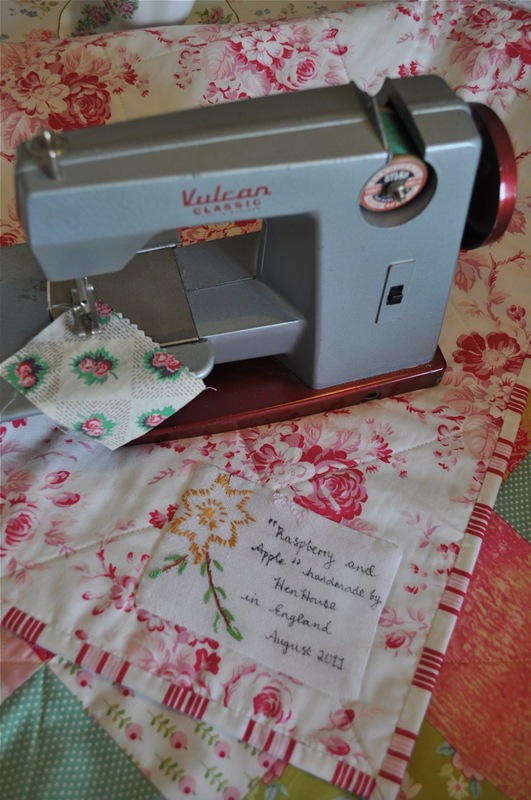 This "Raspberry and Apple" Quilt (the name makes me think of crumble! *) is awaiting a new home in my blogshop. Perfect for cosying up on those Autumn nights heading our way. It is dark here now by about 8.30pm. Oh, how I hate dark nights. Thank goodness for roaring fires, hot chocolate and cosy quilts! Well, it should be a while before another quilty ta-dah comes along. Thank you for indulging two days' posts with quilty ta-dahs and sales patter. Even if you're not in a position to purchase, I hope you've enjoyed the snaps and maybe even taken away some ideas to make quilts of your own. In fact, I know this is true because some of you have been kind enough to write and tell me so. Thank you, lovely people. Mrs Hen House that's such a beautiful quilt! I'm sure it will be snapped up mighty fast. I love your choices of fabrics and the backing fabric is gorgeous. I usually use a plain backing but it's so much more special to use a pattern. And I adore the Tilda fabrics. 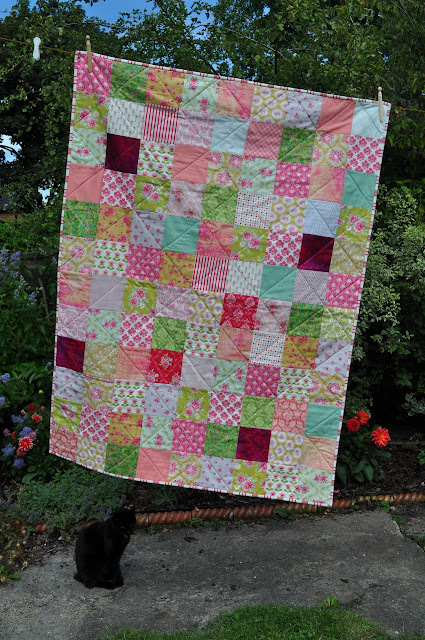 I made a wedding quilt out of the same fabric line recently, but in the cooler color theme pink, gray and blue. And it was here I saw the labeling the first time!!! I've been searching everywhere for it. I saw your labels long long long ago but when I decided to start labeling my quilts I just couldn't figure out where I had seen it... Silly me to not bookmark it in the first place. I think I make my labels slightly different than yours. Without the embroidery that is... But I want you to know that it was your labels that inspired me in the first place to label my quilts as well. May I ask what type of pen you use? I have had a hard time finding a good fabric pen to write with. Thank you for having open doors to your Hen House at all times. It is a pleasure to visit. Beautiful! Pinks and greens are my favourites too. I made a delicious pear and raspberry crumble at the weekend. Very thinly sliced slightly under ripe pears in the base of the dish, fresh raspberries, and instead of adding sugar as per the recipe, I used a couple of dollops of my homemade raspberry jam. Topped with crumble made from plain flour, butter and sugar... it was absolutely delicious served slightly warm with pouring cream. And the remainder with custard the next day! Love all your quilts.. you make me want to get out the machine, stock the shelves once again with fabric I may not use, and get cracking! We had the lights on and curtains closed yesterday by half eight...time to get the blankets/quilts out...the cat will be thrilled-I caught him leaning against a radiator the other morning, with a wistful look on his face. I don't think I've said it before but I really love the embroidered labels you put on your quilts. They make them so special. ...and I'm going to have to make apple crumble tonight! I do so love your quilts - and the best thing about them for me is the little "name patch" on the back. That is just so pretty, wish I could afford to buy it! 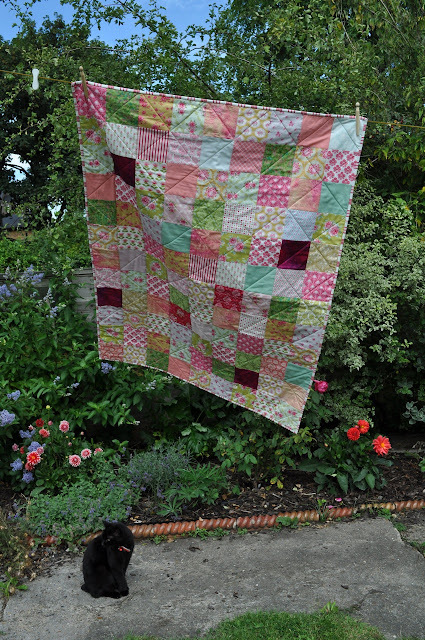 I really must try and make a quilt, will add it to the 'to do' list. I hope you have a lovely trip up North! Hen, the arrangement of colors in this quilt is truly lovely, with a great balance of light, dark, warm, cool, detail and pattern. The fabric you used for the reverse is also rather special! I love reading your blog and seeing all of the beautiful creations that you have made and seeing bits and pieces of the English countryside (I live in California, never been to England). wow. I got my mums old sewing machine recently and ive started to teach myself, one day i hope to make something half as good as this!! 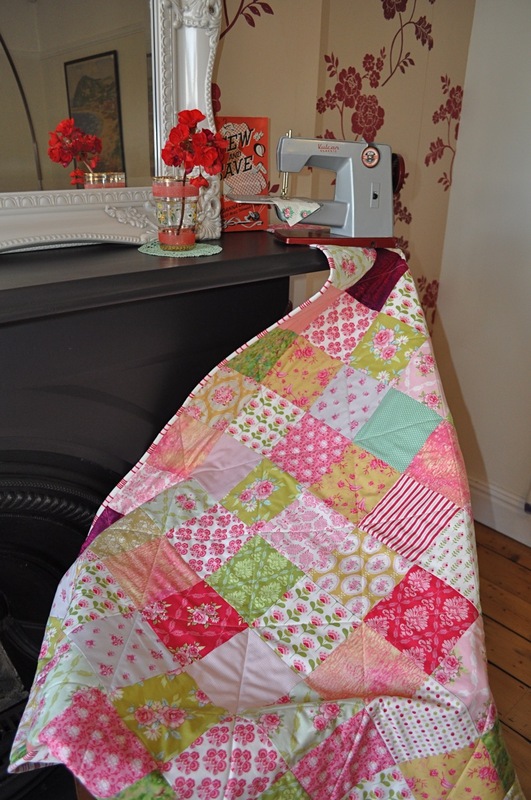 I love the Tanya fabric, so lovely and it makes the quilt extra special. 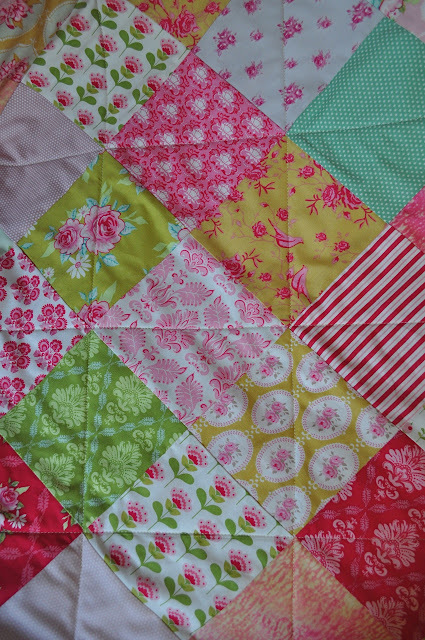 Lovely, lovely colour choice for this quilt and indeed would provide comfort on the chilly Autumnal nights ahead of us. I love the very satisfied expression on Mr. Vorey's face. Naughty boy! Another very special quilt and I love the Tanya Whelan backing fabric. She does have some delicious designs. I get very frustrated by the lack of wide, affordable backing fabrics. I dared to suggest to the ladies at one of my local quilt shops that I would resort to using cotton sheets and they gasped in horror. I'm hoping it will motivate them to find something pretty I can use. Ah, the Vulcan Classic, a relic of my childhood! I suppose a black cat such as VoreyPuss feels that white with vintage embroidery sets his colour off to perfection... then again, he'd look even better against that fab new quilt! If you can, go to the Fabric Guild in Leicester, they have fabulous bargains in quilting fabric. Lovely fabrics, especially the backing! Down here in Texas we call your crumble a "crisp" as in apple crisp. It sounds the same....we put apple slices in the pan, then use flour, cinnamon, and oats with a generous amount of butter to cover the top then bake it until the apples are done and the top is "crisp". We serve it with fresh whipped cream or vanilla ice cream. I do love comparing your world with mine and the quilt is lovely (as usual). I really like this quilt. It's lovely and cheerful. I could curl up under it when the snow flies here in Michgan. 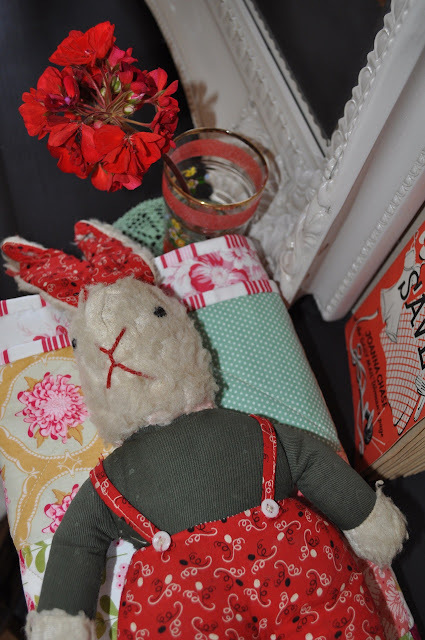 Good book, hot coffee and a Henhouse quilt equal a good day. Love this quilt, especially the backing fabric. (also my two favourite colour combination) would look scrummy on my sofa. Couldn't agree more about the price of quilting fabric, you dont get much for your money. 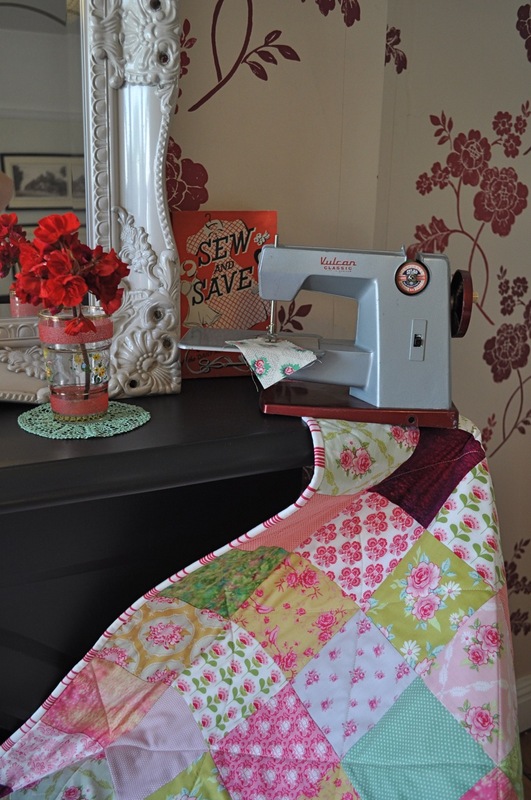 Great post, food, fabric & quilting what more could I ask for.